Ise Kadoya Brewery, which opened in 1997, is a brewery located in Ise city, Mie prefecture. The name Ise Kadoya stems from the area of Japan the brewery is located in and also the family name that has been passed down over the last few centuries. It is owned by the Ise Kadoya Company which also runs a shop called Nikenchaya with links to the local Ise Grand Shrine that dates back to the Edo era as a mochi shop. The brewery runs a brewpub/restaurant called Biyagura which is the primary place for drinking or buying their beer. Ise Kadoya Brown Ale – a 5% brown ale that was first brewed in 2005 in response to the popularity of the pale ale. Ise Kadoya Ise Pilsner – a 5% Czech pilsner brewed using Saaz hops. Ise Kadoya Kumono Kudo Beer – a 5% brown ale brewed as a homage to the Kumono Kudo World Heritage site. Ise Kadoya Pale Ale – A 5% American pale ale that has won numerous international beer awards. Ise Kadoya Premium Kagura Beer – a 6.5% IPA brewed using Citra hops. Ise Kadoya Sinto Beer – Pronounced “shinto”, this is a 5.5% pale ale throwback to the Meiji era of beer. Ise Kadoya Stout – A 5% English style stout that is brewed with six different kinds of malts. Ise Kadoya Ad Lib IPL – a 6% Indian Pale Lager and is a collaborative brew with Spring Valley Brewery with the head brewers from the Tokyo and Kyoto branches coming to Ise Kadoya to brew. It’s brewed using Galaxy and Citra hops. Ise Kadoya Cardamom Porter – An 8% spiced porter brewed with orange peel, cacao powder, and also cardamom. Ise Kadoya Crossing New IPA – a 6.5% American IPA that was brewed with TY Harbor as part of Ise Kadoya’s and TY Harbor’s 20th anniversary. Ise Kadoya Dry Stout – a 5% dry stout brewed alongside the Ise Kadoya Oyster Stout but this one contains East Kent Golding hops instead. Ise Kadoya Grapefruit IPA – A 6% IPA brewed using fresh grapefruits in the mash. Ise Kadoya Hanakin Citrus – a 5% fruit beer and used yeast harvested from carnation flowers. Ise Kadoya Hanakin Gold – A 4% golden ale that is made using yeast from marigolds – hence the ‘gold’ part of the name. Ise Kadoya Hanakin Saison – A 4% saison that contains four different kinds of hops. Ise Kadoya Hanakin Tanpopo – A 4% porter that uses yeast harvested from tanpopo, known in English as dandelions. Ise Kadoya Happy Hop IPA – A6% American IPA brewed with Simcoe and Citra being two traditional IPA hops used, along with the two “new” hops of Polaris and Wakatu. Ise Kadoya Heavy Jack IPA – a 6.4% IPA brewed with Simcoe and Amarillo hops. Ise Kadoya Hime White – First brewed in 2009, this is a 5% Belgian witbier that contains yuzu instead of orange peel. Ise Kadoya Imperial Red Ale – First released in 2011, this is an IBU 85 red ale with an abv of 6%. Ise Kadoya Hoppy Potter – A 6% hoppy brown porter with an IBU of 35. Ise Kadoya Imperial India Pale Ale – An 8% double IPA that uses 10 different hops added at 120 different intervals. The hops used in Ise Kadoya Imperial India Pale Ale are Cascade, Galaxy, Amarillo, Topaz, Centennial, Sorachi Ace, Columbus, Stella, Citra, and Willamette. Ise Kadoya Inazuma IPA – A 6% American IPA brewed using Polaris and Citra hops, imported from the USA. Ise Kadoya Itsumono IPA Galaxy – A 6% American IPA while the Galaxy hops are sourced and imported from Australia. Ise Kadoya KoiKoi Mikan – A 4% seasonal fruit ale made with Naize Mikan oranges from south Mie prefecture. Ise Kadoya Lush Hop IPA – A 6% IPA that uses yeast imported in from San Diego. Ise Kadoya Malty Fields – A 5% English pale ale that was first brewed in 2011. Ise Kadoya Mosaic IPA – Brewed exclusively with Mosaic hops to produce an IBU 45 IPA with an abv of 6%. Ise Kadoya Mt. Cook IPA – Take New Zealand Nelson Sauvin hops and make a 6% IPA. Ise Kadoya Nachtmusik #2 Almond Coffee Stout – A 5% stout that was a collaborative brew with the Facebook Cheers With Beer! group. Ise Kadoya Neko Nihiki – An 8% NE IPA and is part of a collaborative brew they did with Culmination Brewing, an American brewery based in Portland, Oregon. Ise Kadoya Niihime – A 5% fruit beer brewed using niihime (新姫) which is a fruit from Mie prefecture that was the result of hybridization between a tachibana (a kind of citrus fruit) and a mandarin orange. Ise Kadoya Oni no Slimy Tears IPA – A 6% American IPA and is part of their collaborative range with Oni Densetsu, based in Hokkaido. It was brewed to celebrate Ise Kadoya’s 21st anniversary in 2018. Ise Kadoya PaPa Ale – A 4% session pale ale brewed with seven kinds of malt. Ise Kadoya Platinum Dragon – A 4% session pale ale whichuses the Ise Kadoya Golden Dragon as its base and has been made “sharp”. Ise Kadoya Platinum Dragon R2 – A 4% session IPA brewed to be a West Coast IPA-lite with a lower alcohol content than its contemporaries. Ise Kadoya Rose Red Ale – A 5% red ale that continues with the hanakin series, with this one having yeast harvested from roses included during the brewing process. Ise Kadoya Snowsmile IPA – A 6% American IPA brewed using two different strains of yeast – the inhouse Kadoya 1 and also an ale yeast. The hops used are Chinook, Amarillo, Mosaic, and Centennial. 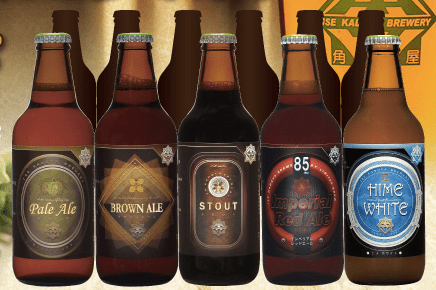 Ise Kadoya Scotch Ale – A 7% Scotch ale that has had continued evolution since 1997. Ise Kadoya Stay Gold IPA – a 6.5% American IPA with the idea behind it being to make something drinkable and light for the hot summer months in Japan. Ise Kadoya Strong Stout – A 9% imperial stout that is Ise Kadoya’s strongest beer on sale. Ise Kadoya Struggle IPA – A 7% American IPA brewed with 10 (yes ten!) different hops, which are Amarillo, Cascade, Centennial, Chinook, Citra, Cluster, Mistral, Mosaic, Simcoe, and Zeus. Ise Kadoya Summer Beach IPA – A 6% American IPA brewed using 8 different hops: Authanum, Cascade, Centennial, Polaris, Ekuanot, Waimea, Summer, and Falconer’s Flight. Ise Kadoya Tanpopo Gold IPA – A 6% American IPA with this one using yeast harvested from tanpopo, or dandelions. While it is an American IPA. Ise Kadoya The Force IPA – A 6.5% American IPA and is brewed using Citra, Equinox, and also Mosaic hops. Ise Kadoya Tokyo Wheat – A 4% wheat beer that was made to celebrate Tokyo Beer Week in 2015. Ise Kadoya Triple Hop IPA – A 6% IPA hopped with Amarillo, Citra, and Simcoe hops. Ise Kadoya Up Up IPA – A 6% American IPA brewed in collaboration with Uetake-san and uses imported American Amarillo, Cascade, and Mosaic hops. Ise Kadoya Uramura Kaki Stout – A 6% oyster stout that is brewed with locally sourced oysters (Japanese review). Ise Kadoya Wild Boys’ IPA – A 6% American IPA and is part of a 2017 collaboration brew with Mondo Brewing, a London based brewery. Ise Kadoya Yuzu Dragon – A 4% fruit beer brewed with locally sourced yuzu, or Japanese citron. Ise Kadoya Yuzunoka Ale – A 5% fruit beer and is brewed with locally sourced yuzu, or Japanese citron, with both the flesh and skin being used in the secondary fermentation stage. Ise Kadoya Yuzunoka NEIPA – an 8% NE-IPA brewed using locally grown yuzu, also known as Japanese citron, alongside Amarillo, Mosaic, and Simcoe hops. Ise Kadoya Mocha French Coffee Stout – 5% stout that is draft only and is part of their coffee stout series. It’s brewed using mocha coffee. Ise Kadoya Kenya Coffee Stout – a 5.5% stout brewed with single origin Kenya coffee beans though they are added in the secondary fermentation part of the brewing process.